It’s easy to imagine Sarah Sanders ribbing General Kelly for giving the media propagandists the fresh meat comments that she’s going to have to go out and deal with, knowing the frothing hysteria that awaits her. It almost makes one wonder if they aren’t toying with some of these libtards just a bit, to give them the shiny objects that they can’t resist just to watch them twist themselves up. One of the most predictable is CNN’s Jim Acosta, a naturalized Cuban who believes we should import all of his native land and the rest of the third world so that there’s no America left and not a square mile untouched. 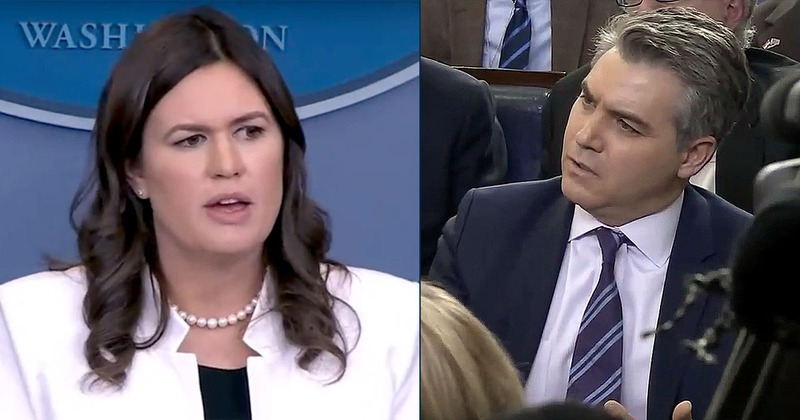 Acosta asks, “Can I get back to the Chief of Staff saying that some of the dreamers [DACA protected squatting illegals] may just have been too lazy to get off their asses.” Unable to dispute the accuracy of that statement and as usual focused on demeaning the President and his administration in any manner possible, Acosta focuses on the tone of the comments. He asks, “Just on the face of it, isn’t that just a wildly offensive comment about these undocumented immigrants [illegal trespassing squatters] who are waiting for some kind of solution to come out of this city?” You mean they’re waiting for buses to be fueled up and loaded, the most obvious solution, Acosta? Sanders points out that President Trump is the only one who has offered a solution and that it was quite generous, granting citizenship to 1.8 million. She doesn’t mention the fact that they are individuals who have forced their way to the front of the line, ahead of those who are applying for citizenship legally, but she should have. She doesn’t give him what he’s looking for, saying, “I think that’s something you’ll have to decide for yourself.” Clearly he, his network and the other libtards in the room made that decision years ago. Anything President Trump does is offensive to them. Judge Janine cannot run for office, she divorced a man who made a terrible mistake and cost her, but she also made her own mistake by not allowing a DNA test in a case. She cannot run for or be appointed to anything. if i were running the show, there would BE NO CNN OR ANY OTHER PROPAGANDA MACHINE WITHIN A HUNDRED MILES OF THOSE BRIEFINGS. ENOUGH OF WASTING TIME WRANGLING WITH THEIR COMMUNIST STUPID USELESS EATERS. Sara is a lot quicker than most give her credit for, I think she’s great. I’m not fond of her father, but she’s superb and quick on her feet with a comeback. I think she and Judge Janine should run for office, maybe President and Vice President. They are both like the President in what they believe in, like female Trumps. We could throw in Melania also. She’s quiet, but that means she’s a thinker.